Contact Lenses ~ Drs. Price and Shepler are well educated when it comes to contact lenses. They offer the latest technology in contacts. The doctors offer gas permeable, disposable, colored, astigmatic (toric) and extended wear contacts. Call today to see how Drs. Price and Shepler can help you with your contact needs. Children’s Vision ~ According to the Vision Council of America, 80% of learning in a child’s first 12 years comes through the eyes. The National Eye Institute has found the most common cause of visual impairment in childhood is due to Amblyopia, or lazy eye. This can cause your child’s learning, recreational activities and participation in sports to suffer. 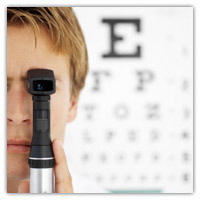 The school vision screening test is not enough to determine if your child has this or any other vision problems. Drs. Price and Shepler have tested children as young as 6 months and provide them with the highest quality in eye care. 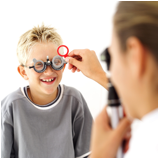 Please contact our office today to schedule your child’s eye exam. Sports Vision ~ All sports have different visual demands. With Dr. Price’s experience and expertise in sports vision he can help you determine the best course of action for your visual needs. Whether it is contact lenses, sports goggles or vision therapy, Drs. Price and Shepler would be pleased to assist you with your sports vision needs. Industrial Safety Glasses ~ Many jobs today require safety glasses from factory jobs to mowing the lawn. Drs. Price and Shepler offer a wide variety of safety frames. All frames are OSHA approved and meet ANSI requirements. You may choose from standard safety frames to Titanium or even non-conductive frames. We use only polycarbonate lenses, which are impact resistant, meaning they will protect your eyes from metal and other debris. Your eyes are important to Drs. Price and Shepler so call today to see what is available for you. We offer industrial frames to everyone.